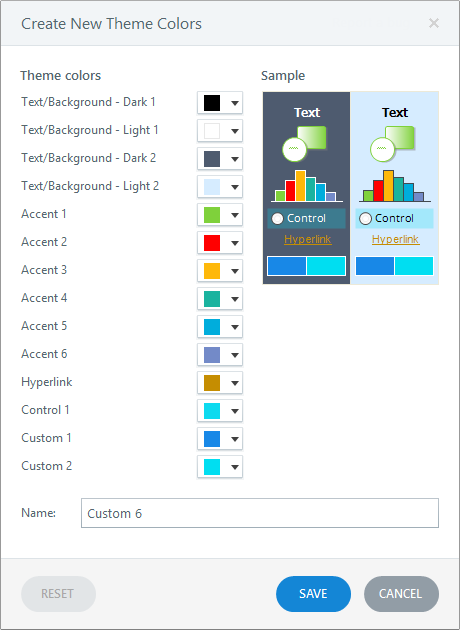 Theme colors control the default color options throughout Articulate Storyline. Several built-in themes are provided for you, but you can also create your own custom themes. 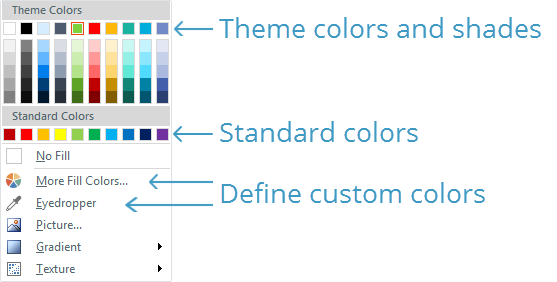 If you've created any custom theme colors, they'll appear at the top of the list in the Custom section. Built-In theme colors appear beneath that. The theme colors currently in use for the selected slide have a thin orange outline. Each theme shows a palette of eight colors. The first two apply to text and backgrounds. The last six are accent colors—for example, shape fill options. To see the entire color palette for any theme or to modify a theme, jump to the section on Customizing Theme Colors later in this tutorial. 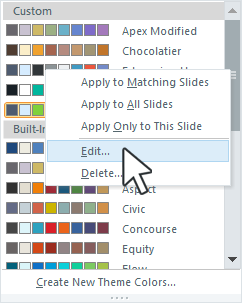 Apply to All Slides: This applies the theme colors to all slides in your course. Apply Only to This Slide: This applies the theme colors only to the currently selected slide(s). Edit: This opens the theme colors editor. (See Customizing Theme Colors below.) This option is only available for theme colors you've created, not any of the built-in theme colors. Delete: This removes the selected theme colors from Storyline. This option is only available for theme colors you've created, not any of the built-in theme colors. 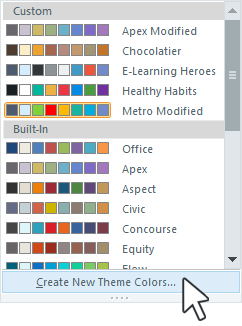 When the theme colors editor appears, use the color selectors to assemble your palette. The Text/Background items make text easily readable when applied to shapes. For example, dark text is designed to be readable when placed in lighter-colored shapes. Accent 1 is the default fill color for shapes, captions, check marks in check box styles 1 and 2, and dots in radio button styles 1 and 2. Control 1 is the hover color for buttons and answer choices. Custom 2 is the default color for check marks in check box styles 3 and 4, and dots in radio button styles 3 and 4. For each item you want to change, use its color selector to assign a different color. If you don't see a color you want, use the Eyedropper option to select any color on visible on your screen, or choose More Colors and do any of the following when the Colors window appears. 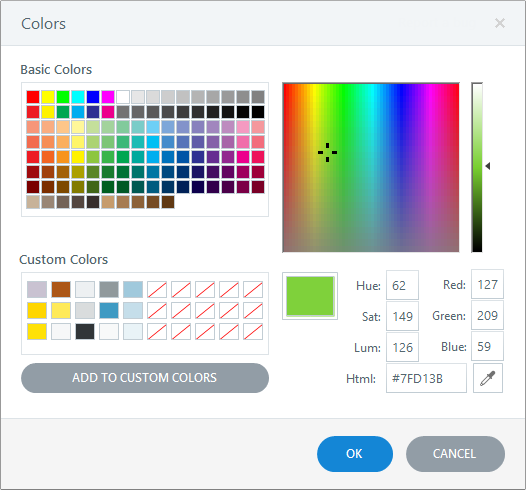 Use the color picker to choose a custom color from anything on your screen. Just click the eyedropper, hover over an area of your screen, and click it to choose that color. In the Name field, enter a name for your new theme colors. 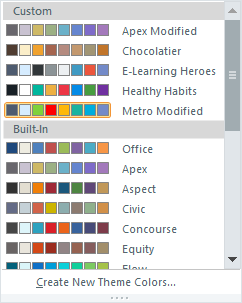 When the theme colors editor appears, use the color selectors to modify your palette. First, apply the built-in theme colors you want to use as your base colors to your course (i.e., left-click the theme). Then, click the Colors drop-down again and choose Create New Theme Colors. The theme colors editor will open, and the colors will default to those from the built-in theme you're currently using (from step 1). Just edit the colors to your liking and save the theme colors under a new name.